Nelly, as she liked to be known, was born in the mean alleys round Covent Garden of an unknown father and a mother notorious as a ‘brandy-soak’. Nelly’s childhood was a constant round of beatings and hard work, but when her fortunes changed, Nelly brought her mother to live with her and when she was found drowned in a brook, paid for an elaborate funeral. I have heard of various starts to Nell’s life, but Gillian Bagwell’s Nell was an oyster seller who, fearing a rapid old age and continued poverty, decides on the day that King Charles II returns to his throne that she will follow her sister Rose into whoring. Her pretty face and neat figure, not to mention her quick tongue, helped her acquire a post as an ‘orange wench," selling fruit in the theatre pit. Fascinated with the theatre, and with the help of her first long term lover, Charles Hart, she starts acting on the stage and comes to the attention of King Charles II. John Dryden described Nell as, ‘"Oval face, clear skin, hazel eyes, thick brown eyebrows ... a full nether lip ... the bottom of your cheeks a little blub, and two dimples when you smile." Like all the King's women, Nell was paid out of the Secret Service funds. Second only to Louise de Keroualle, the Duchess of Portsmouth, her greatest rival apart from the fading Barbara Palmer, Nell was given a house in Pall Mall and an annual income of £5,000. Nell was one of the least greedy and most faithful of Charles II’s mistresses, despite that he kept them in houses, jewels, titles and producing numerous children who all had claims on the royal purse. Nell had two sons by Charles II. Charles Beauclerk who went on to have eight sons of his own and James, nicknamed, Jemmie who died when he was nine. Nell had many true friends in the Royal court, many of whom she helped through hard times, among them, George Duke of Buckingham, Rochester, Killigrew, Aphra Benn the lady playwright, the ill-fated Duke of Monmouth, and of course her beloved Charles Hart who was always her first love. When anti-Catholic riots took place in London in the late 1660’s, Nelly's coach was mobbed by Whigs, who thought it carried the King's Catholic mistress, Louise de Keroualle. [Whom the King called ‘Fubbs’and Nell nicknamed, ‘Squintabella’] Never at a loss, Nell stuck her head out of the window and bellowed: "Pray, good people, be civil. I am the Protestant whore." On his deathbed, Charles besought his brother and heir, "Let not poor Nelly starve." James II kept faith, although her life was less extravagant after her royal lover’s death. Nelly died of a stroke brought on by an occupational disease, at 37. 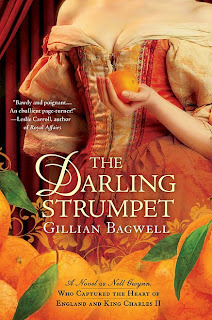 Gillian Bagwell’s meticulously researched novel takes us from the cobbled, rubbish-strewn alleys of Covent Garden to the Royal Theatre in Drury Lane and into the royal court. She handles the 17th Century London street vernacular with aplomb, and Nell comes across as the epitome of the ‘tart with a heart’, who never apologises for her profession and is generous with both her time and her money. I got the impression Nell truly loved her ‘Charles the Third’ as she called him, and was distraught when he died. Miss Bagwell’s interpretation is a colourful and sympathetic portrayal of a young woman whose beginnings foretold only misery and heartache, and that Nelly herself not only took advantage of her assets to make her life, and that of her family better, but she never took it for granted or became too greedy, like many of her rivals. I enjoyed the romp through 17th Century London, and learned a lot about how the actresses owned their ‘parts’, and when they married or, as was more frequent, taken up by a lover, they returned their ‘parts’ to the theatre owners, which was when they could be played by other actresses. I can thoroughly recommend this book, and look forward to Miss Bagwell's next foray into 17th Century England.